The Cautionary Tale of Joba | How Do I Baseball? As the 2012 offseason begins to wind down, so does the list of available free agents, and the number of possible roster spots that the likes of Michael Bourn and Kyle Lohse could possibly fill for a team in 2013. It’s a time of desperation, a time of fitting square pegs into round holes, not only for players and agents, but also baseball writers. 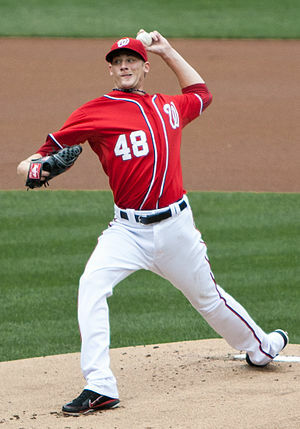 With Rafael Soriano joining the likes of Tyler Clippard and Drew Storen at the back end of the Washington Nationals bullpen, it appears that, aside from possibly adding a short inning lefty arm to complement Zach Duke, the Nats are set in terms of their relief corps. Ken Rosenthal doesn’t seem to think so, and mentions a scenario having the Nats signing Kyle Lohse, then sending lefty starter Ross Detwiler to the ‘pen being bandied about. Great idea, right? Add a solid #4/5 starter, then have a great shutdown lefty, in the form of Detwiler – win/win! As Dan Kolko mentioned in his article, Detwiler was drafted as a starter, and is just now coming into his own as a starting pitcher, after several years of being bounced from the starting rotation to the bullpen. A trip back to the bullpen would send the wrong message to Detwiler, who is just now beginning to live up to the promise he showed when the Nationals made him their first pick in the 2007 MLB Draft, out of Missouri State University. Anecdotally, tall pitchers tend to take more time to develop, as it takes time for them to consistently replicate their pitching mechanics, pitch to pitch. Lefthanded pitchers are also notorious late bloomers, for an assortment of reasons. Knowing that Detwiler is both tall and lefthanded, we simply see the ramifications of the natural progression of a tall lefty; good things come to those who wait. …and wait the Nationals should – all while exhibiting patience and staying true to their blueprint for 2013, which should have Detwiler as their #5 starter. A return to the bullpen could prove catastrophic for Detwiler and the Nationals, not only from the psychological aspect of a ‘demotion’, but also from a long term perspective. If the Nats need any historical inspiration to keep Detwiler in the starting rotation, they don’t have too look far back into the annals of baseball for a cautionary tale. They only need to go as far back as 2011. June 16, 2011, Joba Chamberlain had Tommy John surgery, ending his season, and by the looks of it, his career as a starter. Like Detwiler, Chamberlain was drafted as a starter out of college, going back and forth between starting and relieving since coming up to the New York Yankees in 2007. Spending most of 2007 as a reliever, Chamberlain spent 2008 primarily in a bullpen role, mixing in 12 starts throughout the year. In 2009, the Yankees used Chamberlain almost exclusively as a starter, making 31 starts, chalking up 156.1 innings, and enjoying a 9-6 record, with a 1.8 fWAR. After losing out on a rotation spot to Phil Hughes the following season, the Yankees powers that be again changed their minds, and scrapped plans to have Chamberlain as a fixture in the starting rotation, and used him in the bullpen, primarily as a set up man for Mariano Rivera. Post surgery, Chamberlain has been further relegated, now to a middle inning reliever, pitching 20 innings in 2012 to the tune of a 0.1 fWAR, 11 hits per 9 innings, and 1.55 WHIP. While there is still time for Chamberlain to continue to recover from Tommy John surgery, and to fully accept and acclimate himself to the bullpen role he sees himself in for the foreseeable future, Chamberlain’s career is one indelibly marred by the indecisiveness of the Yankee front office. Success in baseball remains an exercise in vision and perseverance. For Chamberlain and the Yankees, only one half of this equation was satisfied, and led to the promise of Chamberlain as the keystone of future Yankees starting rotations to be left unfulfilled. For the Nationals, it is imperative for them to stay true to the vision they had in 2007, with Ross Detwiler as a starting pitcher; they cannot be sidetracked by a myopic pursuit that would peg him as a short inning reliever for 2013. Detwiler’s time is now, and it’s time for him to be a starter.